The new design will include one vehicular lane, pedestrian and bicycle routes and will also accommodate the Centennial Trail. SPOKANE, Wash. — According to the city of Spokane, the Post Street Pedestrian downtown Spokane is in need of of repairs. 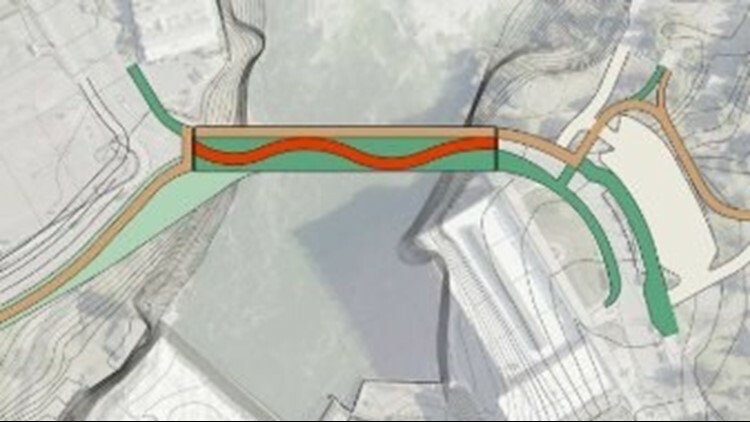 There are some restrictions to the designs -- there is only one vehicular lane that travels northbound, the south approach to the bridge must tie into one lane of Post Street and the Centennial Trail along the bridge will need to be routed to the northeast side of Post Street to allow connection to Riverfront Park. To view all the designs, visit the city's website. The city is also asking for input from the public on the barriers. They have three different options to choose from -- formliner, which is a concrete formliner base topped with metal railing, historic or semi-transparent, which would enable river views.